The Tucson apartment market has been driven by a multitude of factors. The first factor that is driving the apartment market is that higher paying jobs are entering the Tucson economy. Tucson’s job growth remained relatively stagnant the past five years with median household income in the metro area 15.5% below that of the U. S. Several recent, high-profile jobs announcements included hundreds of highly-skilled and highly-compensated positions. The second wave of employers contracting with and supporting these primary employers will broaden the opportunities at all levels. As reported by the MAP Dashboard project, Tucson’s MSA enjoys a lower cost of living than many of its peer cities in the West and was 3.0% below the nation, driven largely by rental rates (2015 data). The second factor driving the Tucson apartment market is the influx of capital. Syndication groups, private equity groups, high net worth individuals and institutions from Phoenix, Denver, Los Angeles, Portland, and even Canada are selling their real estate in their respective cities and moving capital to the Tucson apartment market. These groups are attracted to the favorable cap rates and still favorable interest rates. About 90% of all apartment investors considering apartment investments in Tucson are from outside of Arizona. Demand is high and volume is strong, with the value of transactions year to date exceeding 2016’s annual volume ($452M versus $390M) and on pace to exceed all years since 2006. Our listings average seven to ten days on the market. Average cap rates are below 7.0%, again for the first time since 2006. That being said, the third factor driving the apartment market is lack of inventory. Tucson only posted 22 transactions for apartment buildings 20 units and above in the previous quarter. Although the number of transactions is higher this past quarter than in comparative years, this is still low compared to more primary markets. Inventory is low primarily because apartment owners do not know where to place their proceeds if they were to sell their investment property. Many owners have seen appreciation during their tenure of ownership; therefore, capital gains tax is a concern. Many apartment owners believe apartment prices will rise and do not want to trade into high values. In the quarter ending June 30th, statistics for the Tucson multifamily market saw the vacancy rate for conventionally-operated, stabilized units increase by thirty basis points to 6.82%. Total occupancy during the second quarter improved by 191 units. The submarket with the lowest second quarter vacancy is Northeast Tucson with a vacancy rate of 5.18%. These submarkets are followed by Catalina Foothills with a vacancy of 5.32% and Northwest Tucson with a vacancy of 5.45%. Of significance, this reflects the first quarter since 2005 that every submarket posted vacancy rates below 10%, indicated more widespread health in the market. Summing up statistics for the second quarter 2017, there were a total of 10 transactions for apartment buildings 40 units and above. The average sale price was $95,542 per unit and $119.31 per square foot. The average year of construction for properties sold was 1986. On a positive note for investors, after years of flat rents, Tucson is in its sixth year of rental growth. The average monthly gross apartment rent without utilities in Metropolitan Tucson was $709 per unit or $0.96 per square foot for the second quarter. This represents a $16 (2.31%) increase from last quarter. 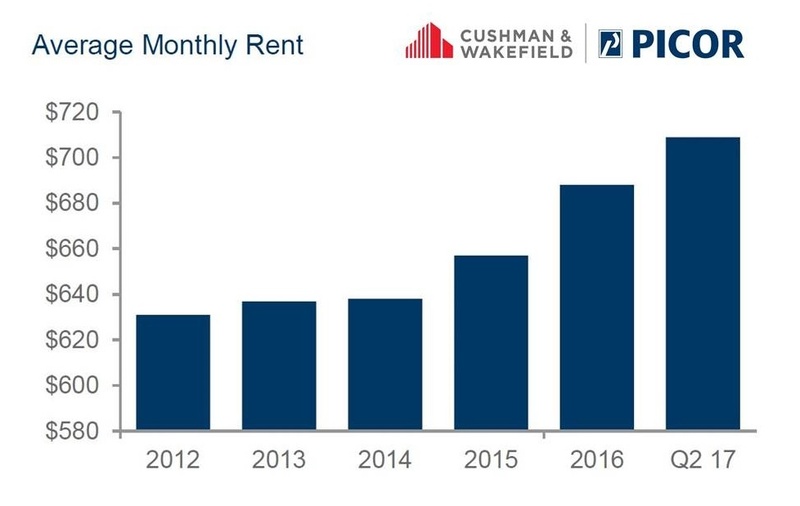 The rental market continues to strengthen quarter after quarter. Tucson’s growth is accelerating after the years of stagnant and minimal rental growth Tucson experienced compared to that seen in neighboring markets. Investor interest continues to be at a high, with the limited willingness to sell driving the values of apartments. We have seen a significant increase in available student housing opportunities with many owners/developers looking at exit strategies. We anticipate similar growth patterns for the rest of 2017 in the broader Tucson apartment market and look forward to the rising tide improving overall economic prosperity in the region.